1. Do you believe plume/bloom is a real thing? Please feel free to post your info and I will bring the best into this opening post. Journal of Chromatography A, Issue 1086, Pages 107–114 (2005). Propylene glycol, known also by the systematic name propane-1,2-diol, is an organic compound (a diol alcohol), usually a faintly sweet, odorless, and colorless clear viscous liquid that is hygroscopic and miscible with water, acetone, and chloroform. If this is formed as a fatty acid ester, this can yield a white solid form of propylene glycol. Propylene glycol esters of fatty acids are mixtures of propylene glycol mono- and diesters of saturated and unsaturated fatty acids derived from edible oils and fats. Ethyl acetate is a colorless liquid that is a volatile and somewhat polar solvent commonly found in nail polish remover. This likely will not crystallize as it would more likely evaporate once it hits the surface and comes in contact with air. However, as a polar solvent, it is possible that it could dissolve sugars within the tobacco and act as a carrier to bring the sugars to the surface. Once at the surface, the ethyl acetate would evaporate and leave behind the sugar, which would be in crystalline form. Propanoic acid is a colorless liquid that can be solid if it's the anion of a salt. Propanoic acid as a solid salt is commonly either: sodium propionate, calcium propionate, or potassium propionate. The calcium and potassium propionates form white crystals, and the sodium propionate forms transparent crystals. So depending on the soil that the tobacco is grown in, different amounts of sodium, calcium, and potassium could lead to different forms of the propionate crystals. Benzyl benzoate is the ester of benzyl alcohol and benzoic acid. This colorless liquid is formally the condensation product of benzoic acid and benzyl alcohol. Ethyl maltol is an analog of maltol, where the methyl group on maltol is substituted with an ethyl group. It is a stable white crystalline powder at room temperature and easily dissolves in many polar liquids. This chemical has a sweet odor that can be described as caramelized sugar and cooked fruit. It is an important flavourant for the food, beverage, and fragrance industry. Ethyl maltol is non-toxic, highly pleasant to human sense of smell, and easily detected by the human, with as little as 10 parts per million perceivable in air. Isoamyl acetate is a clear colorless liquid that is only slightly soluble in water, but very soluble in most organic solvents. Isoamyl acetate has a strong odor (similar to juicy fruit), which is also described as similar to both banana and pear. Banana oil is a term that is applied either to pure isoamyl acetate or to flavorings that are mixtures of isoamyl acetate, amyl acetate, nitrocellulose and other flavors. 5-ethyl-2-methylpyridine is a colorless, clear liquid with a very strong odor of nuts, raw potatoes, and earth. Acetophenone is an organic compound and is the simplest aromatic ketone. This colorless, viscous liquid is a precursor to useful resins and fragrances. Acetophenone is used to create fragrances that resemble almond, cherry, honeysuckle, jasmine, and strawberry, and it occurs naturally in many foods. It is used in chewing gum. At one time it was used as a hypnotic under the name of "hypnone." In a 1994 report released by five top cigarette companies in the U.S., acetophenone was listed as one of the 599 additives to cigarettes. Amyl acetate is an organic compound and an ester with a scent similar to bananas and apples, which is not detectable by all people. Dihydroxyacetone is a simple carbohydrate that is primarily used as an ingredient in sunless tanning products. It is often derived from plant sources such as sugar beets and sugar cane, by the fermentation of glycerin. Dihydroxyacetone is a triose carbohydrate. It is a hygroscopic white crystalline powder and it has a sweet cooling taste and a characteristic odor. It is the simplest of all ketoses and, having no chiral center, is the only one that has no optical activity. So, the chemicals in highest abundance that are either solids or can form solids are: propylene glycol, propanoic acid (as propionate crystals), ethyl maltol, and dihydroxyacetone. Also, ethyl acetate could be acting as a carrier to bring sugars to the surface of the cigar." Not speculating on the validity of this, just passing on some info I found interesting.....also not going to spring the $41.95 asked for the relevant excerpt from the Journal of Chromatography. Mike - wow! Simple and to the point. Thank you so much for sharing, it satisfied my need for facts on the subject. Nice sticky. Can we have a vegueros one too? Ugggggggh. I'm on Vaca. Don't want to post. Yes. I've seen oils crystallise. The cleaving of enough complex oils is enough to create new ones with different properties. Not exactly oils. But simple enough organic compounds like medium sized carboxylic acids are solid at room temperature. If they can break off and isolate themselves,Not only would they crystallise, but they would even give a faint sweet, ammonia-esque smell. Aromatic rings can also break off to diffuse through the tobacco leaves and crystallise there. They have distinctive sweet smells. I know both are two classes of chemicals available in tobacco and tobacco smoke. I have posted a journal article from 1968 on this a while back and can't be bothered to reference. Sent by the Enigma on BlackBerry. So... would any of the veteran nay-sayers share exactly why they think plume/bloom doesn't exist or is extremely rare???? What's the diff between plume and bloom? The burden of proof is on the claimant, I would think. They are one in the same. Both figments of people's imagination. I kid, I kid. I do think there needs to be another answer added to the poll. I know some of my posts in other threads regarding plume have been a little cynical, but in all truthfulness I do believe it exists, but I think it is very rare, to say the least. Most of my cynicism has mostly to do with reading countless threads on this and other forums regarding this issue, especially the countless "is this mold or plume" debates. I can honestly say that everyone I have read, and there have literally been hundreds over the years, has turned out to be mold. Unfortunately a lot of these threads come about because some shmuck in a B&M told them it wasn't mold, but plume, and something that was desirable, in hopes to make a sale. I've only encountered one B&M owner in my life who was forthright when talking about the differences between mold and plume. I hope my explanation does not come across as arrogant or condescending because that is not my intent. When I first started out smoking cigars I can't tell you how many mistakes I've made whether it was regarding mold vs. plume or buying fakes, etc. While I don't consider myself an expert, I have learned a ton over the years, usually at the expense of my own silly mistakes. 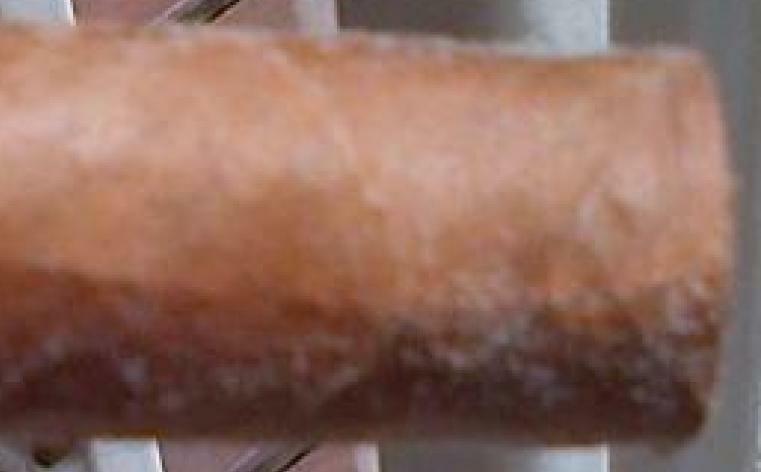 I should also add that when you google 'cigar plume pics', for example, you get a lot of pics that pop up that are blatant fuzzy mold. This certainly doesn't help matters when you have so much misinformation going around, but the internet can be rife with it sometimes. Also, for the sake of disclosure, I have never had a cigar with plume on it. I also have other friends who have much larger collections myself and they have never run across it or produced it, either. That being said, just because I haven't seen it in person I still believe that it does exist, but that it's just a rare ocurrence. If I am never able to reproduce it then it won't be the end of the world, because all that really matters are if the cigars are stored properly and smoke well when you put them to fire. Interests:2 kids, 2 sisters & 2 dogs. Interests:Pirating, Universal Exports,Setec Astronomy, Oil & Gas, Carpentry,Cobra Kai Discipline. Been a member since(2009), took a leave, just recently returned. seen it, have it....have no clue to the science behind it.....don't really care! I had one that looked like you rolled the cigar in super fine sugar crystals. Canadianbeaver is my nom de bloom. A long time ago I had a signature on my forum posts. Not sure if was here or elsewhere. "Why would anyone put anything plumey or moldy in their mouth??" never direct hits on BotL from me! you should know that by now! attack the point, never the person, innit? It's fluffy: this is NOT plume! it's mold starting to spread. No, it's not. Keep on guessing... like always. Of course it is, specially on the 2 first pictures. Look at them with a magnifier. Obviously in the land of the blind, the one-eyed man is king. this is the right part of your first picture, magnified 4 or 5 X. Does it looks like crystal to you?